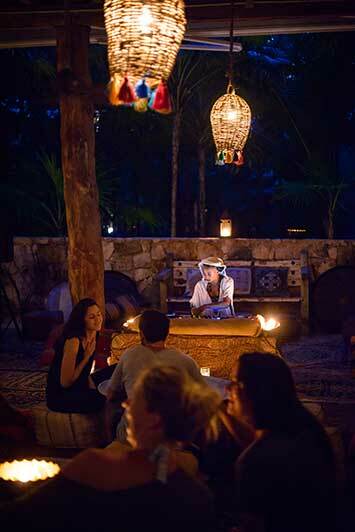 Nomade Tulum is a human centered hotel, conceived as a temporary habitat for those ready to learn and share. Ready to awaken the soul, shake the body and free the mind. 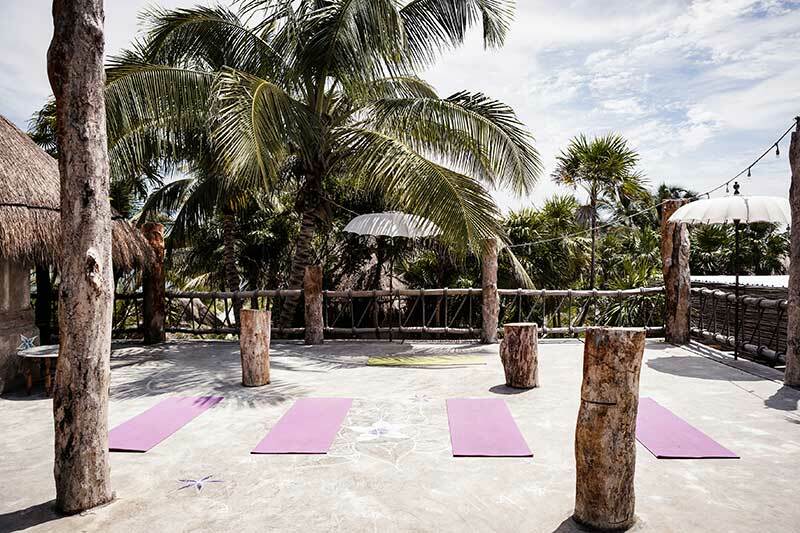 It is a space in a sacred land, on the main beach of Tulum, just a few minutes away from the sea and next to be Tulum hotel. It is surrounded by the most beautiful white sanded beaches, along the Caribbean side. Focusing on creating an experience for self evolution we have put together a unique all year round program of knowledge sharing. Here the mind, body and soul of all our guest will be delighted and fulfilled by mother nature. You will embrace a personal transformation by the consciousness of community. Our Earth Angels Luxury Retreat will run workshops and talks, by a gifted and dedicated individual with extensive experience and knowledge (shamans, healers, therapists, dancers and more). Programs make use of classes and treatments incorporating local and global natural products, materials and techniques. 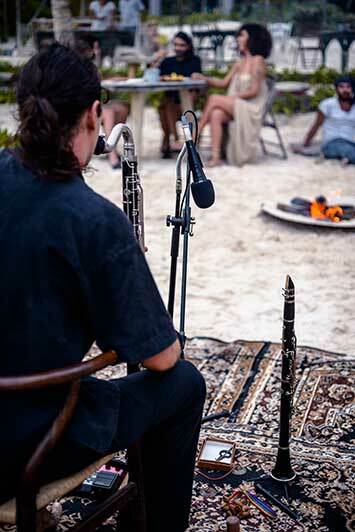 With a unique focus on the shamanic world and traditional original wisdom, medicinal herbs of the amazon and ancestral culture, sound healing, dance ceremonies, daily yoga sessions, massage and other healing modalities can be found, at Nomade Tulum. 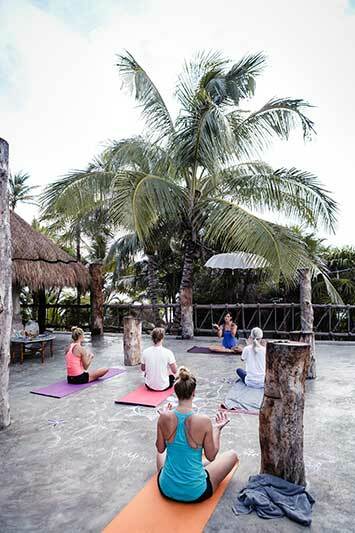 It is also place to relax where you can use the facilities of our Yaan Wellness Energy Spa offering healing, rejuvenation and deep transformation in a magical and organic setting. 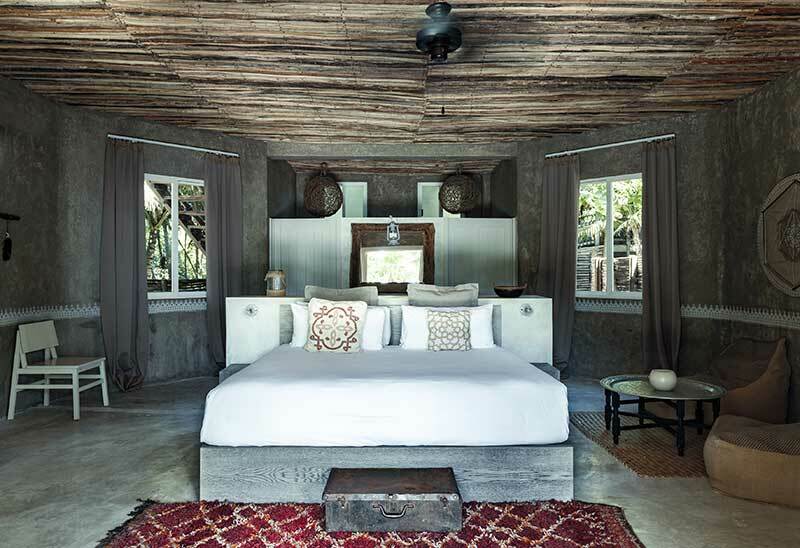 The Nomade Tulum property features 38 spacious rooms and designed for comfort and simplicity, with modern amenities and rustic details that showcase local artisan handcrafts. In addition, our 30 luxury caravan tents offer a charming alternative - built beneath large canopies and featuring wooden verandas, private outdoor showers and bathrooms. All of our accommodations include air-conditioning, telephones, safety boxes, wireless internet and room service. Space meets view; these oversized rooms offer spectacular views of the Caribbean, surrounded by white powder sand. King size bedding, Private bath, premium linens, air conditioner, safety deposit box, bath robes, i-pod dock and wi-fi round up the amenities for this well-appointed suite. La Popular is a fish-market inspired beach restaurant and is tribute to the joys of a life by the sea. By living fully the pleasures of having fresh fish every day, our menu captures the local roots and flavors of the pueblos of our coast and delivers fresh catches of the day straight from the local fisherman´s boat. 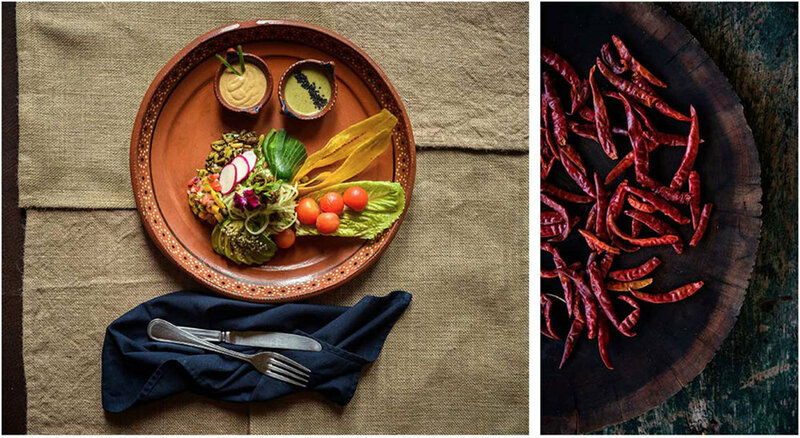 La Popular believes in seafood sustainability and strives to rescue artisanal fishing by sourcing produce locally and ecologically, respecting our ocean and Tulum s´ biodiversity. Discover the flavors of our popular culture, fresh local seafood that varies according to the season, natural refrescos and our house cocktail “frezcal”. As you savor the mouthwatering tastes and irresistible urge to lick your fingers, with your feet on the sand and enjoying the fresh ocean breeze, celebrate with us the abundances of life on the beach. 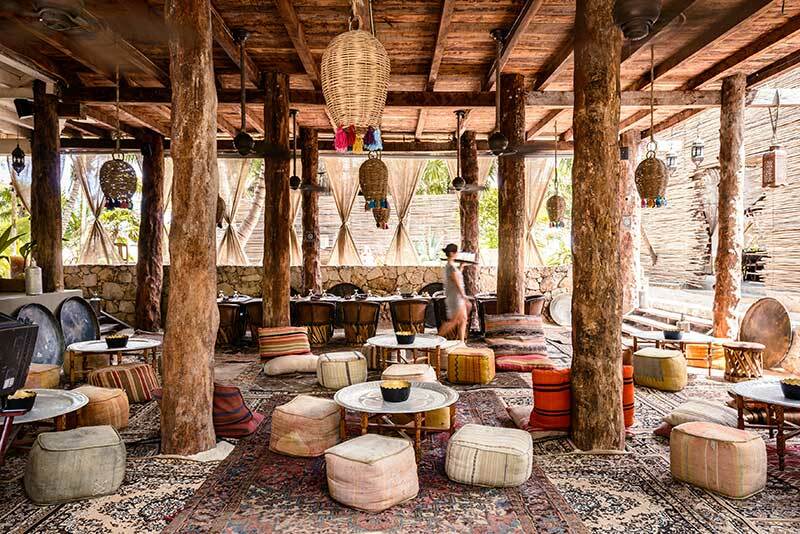 Inspired by the large and lush tropical tree that can reach up to 40 meters in height, Macondo gives life to a dream of delighting Tulum with wholesome and holistic food. Natural and seasonal flavors inspire a variety of vegan, gluten free and vegetarian selection prepared with the intention to heal from the heart and nurture your soul. Using fresh, local and sustainably farmed ingredients, our culinary experts prepare gourmet raw and cooked organic foods with the finest fresh fruits, veggies and herbs the Caribbean can offer. Our menu is often enhanced with Mother Nature’s superfood ingredients filled with vital vitamins and antioxidants, that artistically create a natural, nutritious and delicious cuisine. By bringing a holistic lifestyle to our 20 meter family style table carved from one single large tree trunk, we honor Macondo and the bounties of life. We hope to share with you a whole body wellness consciousness and just simply good food. 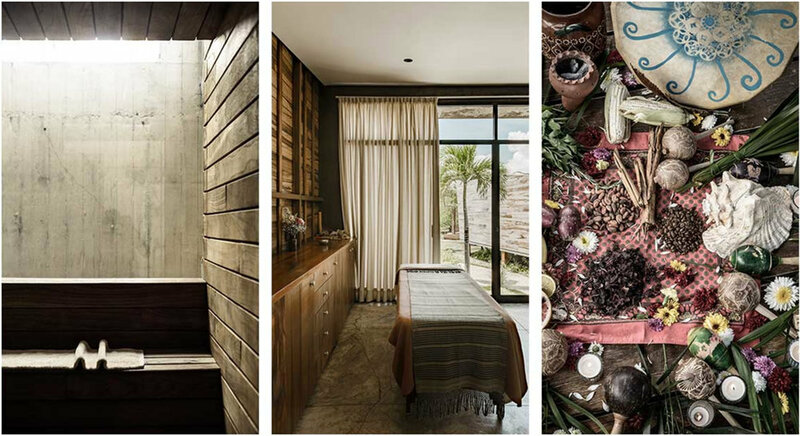 Yäan Wellness Energy Spa is located across the street from Nomade, and offers world class services by a collection of the best holistic practitioners from around the world and Mexico. Healing hands offering different therapeutic modalities and pre-hispanic healing will soothe mind, body and soul and will leave you with a powerful lasting sense of well-being. A variety of treatments will enliven body, mind and spirit.